CleverHome is an electronic tool reconciling comfort and e-control of consumption thanks to two correlated features. First, an energy management feature that allows us to monitor our consumption to the nearest CFAF, know our past and present consumptions and improve our future consumptions. It equally has a home automation feature, to know everywhere and at any time the state of our equipment and command them remotely through a smartphone. The CLEVERHOME product consists of electronic modules connected to a mobile application. There are several types of clever devices, namely: The CleverSwitch to control the lights from the application or manually; The CleverSocket to control an equipment connected to its electrical socket; The Energy Tracking Box to measure the electrical energy in the installation; The Central Unit which is the data base of all the electric parameters and allows the local management of the equipment of a building. With CleverHome, we can : Calibrate our electrical consumption according to a predefined budget and follow it up throughout the month; Know our consumption habits through our daily, monthly and annual consumption graphs and the contribution of each equipment in the global consumption; Receive instant alerts straight to our phone about excessive levels of consumption compared to a predefined budget and alarming statuses of our appliances such as lights left on at abnormal hours; Home Automation done properly will help us save money; Keep us comfortable, safe and secure. The objectives of CleverHome are the following: A responsible consumption of electrical energy by everyone; Saving money through a reduction of electricity bills; Reconciling comfort and energy savings; Energy efficiency. Our project CleverHome contributes to the twelfth sustainable development goal for responsible production and consumption because it helps people to manage cleverly their electrical consumption and control their devices from anywhere and at any time. CleverHome helps users to limit the amount of energy they waste on a daily basis, as they are have a real-time transparency on their energy consumption and can adjust it according to their needs and budget. Moreover, thanks to CleverHome, users will know the contribution of each equipment on their global consumption and will thus manage their equipment to stay within their budget. This management will contribute to a responsible consumption of electrical energy. Lastly, the user will receive instant alerts straight to his phone about alarming statuses of equipment such as lights left on at abnormal hours or an air conditioner left on late at night in an office. He will then have the ability to instantly correct this using his application and will thus save that energy that would have been wasted without CleverHome. These few functions demonstrate the impact CleverHome has on a responsible consumption of electrical energy. We have realised the prototypes of the different clever devices cited above and have carried out test in three installations. The test are satisfactory so far but now, we need to produce more samples to get into our beta testing phase. Once the product gets into the market and is used, our success will come from an optimal use of electrical energy by our target customers. This will be seen by a reduction of their monthly electricity bills and an improvement of their consumption habits. CleverHome will assist them in saving energy daily and will thus, take a big step towards the achievement of a responsible consumption of electrical energy. CleverHome is part of the energy efficiency market. This market has a potential of 219 518 879,62 in Cameroon with our target market, made up of residential and tertiary buildings, taking 49% of this (107 564 251,013 ). Examples of tertiary buildings are public administrative buildings, commercial buildings, restaurants, hotels, hospitals, datacenters, schools, private office buildings, etc. We will sell our electronic modules or clever devices in three packs namely : the CleverStarter kit, the CleverMedium kit and the CleverPremium kit. The application will be free to download on the PlayStore and AppStore and we will receive payments from advertisements made by local companies on our application. Customers will command their kits on our website or on a phone call and the product will be delivered and installed for free. After-sales service will be free 18 months after installation. To finance this project till date, we used our personal savings and grants from family members who believed in the project. To further finance this project, we are preparing to launch an equity crowdfunding campaign. 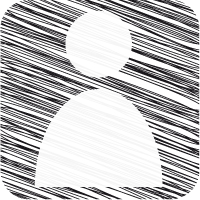 We plan to use this to generate enough revenue to begin the marketing of our product. After three years conquering and extending in the Cameroonian market, we plan to export our product to the countries of the sub-region of Central and West Africa. 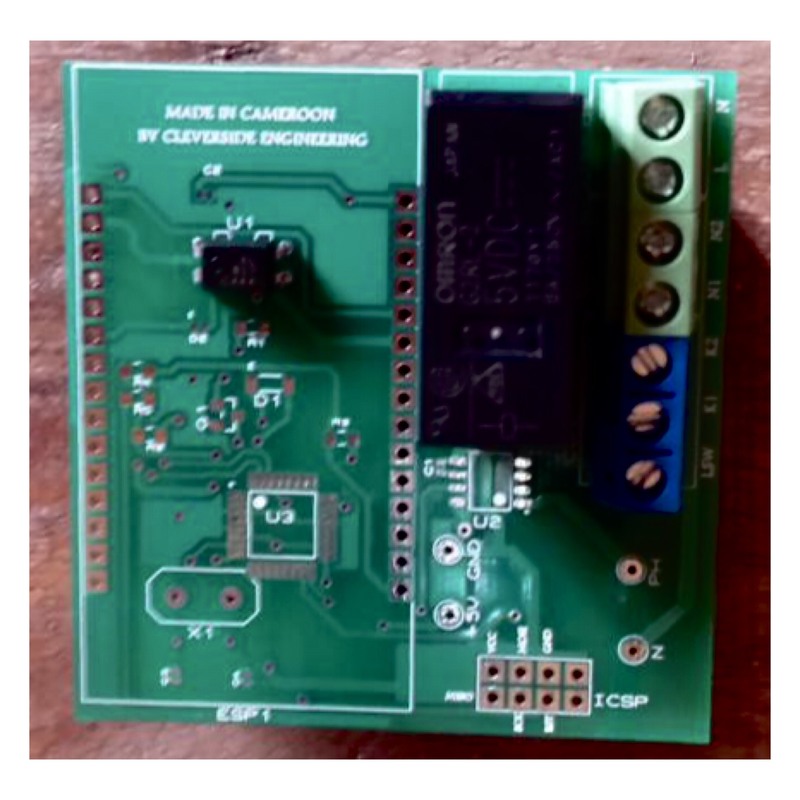 I am a young electrical engineer and entrepreneur living in Cameroon. I am 23 years old and was amongst the five ladies to graduate in July 2017 from the National Advanced School of Engineering in Yaoundé at the electrical engineering department. Born and raised in Cameroon, I grew up in a neighbourhood that benefited from electrical energy 4 days on 7 and saw myself using torches, petrol lamps and candles to study throughout the years. This gave me the desire to contribute to the achievement of a stable electrical network with a better continuity of service for the future generations to come. For this, I had a particular interest in science subjects and had my GCE A level in 2012 in bright colours. Persuaded that ladies can work as good as men especially in domains such as engineering and tech, I am determined in making an impact in these fields and inspiring other women to do same. This project CleverHome is special because it is determinant not only for users but also and most especially for the planet, as saving energy allows us to consider the future of our planet confidently. Apart from my deep interest in electrical energy, I have the gift of leadership. After my engineering studies, I created my company alongside a certificate on entrepreneurship that gave me the necessary skills to manage and lead in the structure I created. I hope to create jobs for other youths and to create a positive impact in the economy and the social sectors of my country. Contributing in achieving energy efficiency in Africa and the twelfth sustainable development goal for responsible consumption and production through my product CleverHome is my driving force. I am passionate and determined to reach my goal. 1.How much to implement this at my home? Is it expensive? 2.Do you have analyser robot(AI or basic auto settings) to monitor and automatically adjust energy consuming of each electronic device to save energy? 3.In near future, you will have english language for the mobile app? All the best for your idea and for your future dear. Am very obliged to meet people like you through this competition, and we all participants will be in touch after this competition as well. May god bless you dear. Thank you for taking your time and energy to look into my project. Thank you for all the comments and encouragements. Lets keep in touch ! Thank you for taking your time and energy to look into my project. I looked into your project as well and it is extremely brilliant, promising and will help our communities a lot. Lets keep in touch and good luck ! Ce projet est très intéressant . Tres Tres Tres Tres Tres Tres intéressant . C\'est l\'idée du siècle . Je savais même pas que c\'était possible jusqua ce que vous en parliez. Beaucoup de courage aux Clever . Lets keep in touch and good luck ! Thank you for taking your time and energy to look into my project. To answer your questions, so far my focus has been the completion and test of the prototype. To survice, I intend to work hard on my image and brand, always innovate and never give up. My hobbies are tennis and politics. To measure up with competition, I make myself unique on my brand. My first capital came from personal savings. My partners are MOUGANO INVESTMENT and yes, we can collaborate. If my idea fails, I will learn and come harder. I will be glad to collaborate with you. Let's keep in touch ! 5. I will have my end product by the end of this year and in five years, it will be extended over all central and west Africa. Thank you for taking your time and energy to look into my project. I looked into your project as well and it is extremely brilliant and promising. My idea came from a problem we face in Cameroon, energy shortages The rest of it was inspired by what is already done in developping countries. Lets keep in touch and good luck ! Thank you for taking your time and energy to look into my project. Thank you for all the comments and encouragements. To answer your question, in an uncontrolled home consumption, 70% of the energy we pay at the end of the month is waste. Too high right ? Lets keep in touch ! Thank you for taking your time and energy to look into my project. I looked into your project as well and it is extremely brilliant, promising and will help our communities a lot.To answer your question, I have passed the test phase of my prototype and I need to start testing on a larger scale. Hopefully, I will have my end product by the end of this year and in five years, it will be extended over all central and west Africa. Lets keep in touch and good luck ! Thank you for taking your time and energy to look into my project. Thank you for all the comments and encouragements. I'll think about your suggestion, seems great. Lets keep in touch ! Thanks for taking your time to read and appreciate my project. To answer your question, yes it is actually a great idea to add a security aspect to the product. We'll definitely do that next time we release. Thanks so much for the comment. Let's keep in touch ! this project is really innovative and interesting; to know that it is a lady who is behind this wonderful idea really amazed me! Thank you for taking your time and energy to look into my project. I looked into your project as well and it is extremely brilliant and promising. But how do you intend to raise the finances for its development ? Hopefully after this, you will take it to another level. Lets keep in touch and good luck ! Thanks very much for your support towards my project since we started up to the end of this phase it was nice and good move . I wish you all the best and lets keep in touch as youth still we have many things to share even after this competation. Thank you for taking your time and energy to look into my project. Thank you for all the comments and encouragements. No you have to plug it in. Lets keep in touch ! Thank you for taking your time and energy to look into my project. I looked into your project as well and it is extremely brilliant and promising. Hopefully after this, you will take it to another level. Lets keep in touch and good luck ! I'm great thank you, hope you are great too. I'll love to meet you too. The key factor of my innovation is energy management from the smartphone or tablet. My business plan is highly realistic and yes, it definitely needs a patent. In the next three years, we expext a turnover of $ 269 760. Thank,you for your interest on my project. Thank you for taking your time and energy to look into my project. I looked into your project as well and it is extremely brilliant and promising. We have a central unit that acts like a main computer as part of the pack. Lets keep in touch and good luck ! Dear Naomi I hope that this competition has full filed your expectations and that you managed to improve your project through whole process. I find your project useful and practical and I would be one of your users. Good luck with your plans, stay bold. vvYes, it was a wonderful journey ! Were about to finish this journey in some hours! Kudos - This a great idea that will definitely benefit households, businesses and other people in your community, as well as worldwide. Continue the great work. 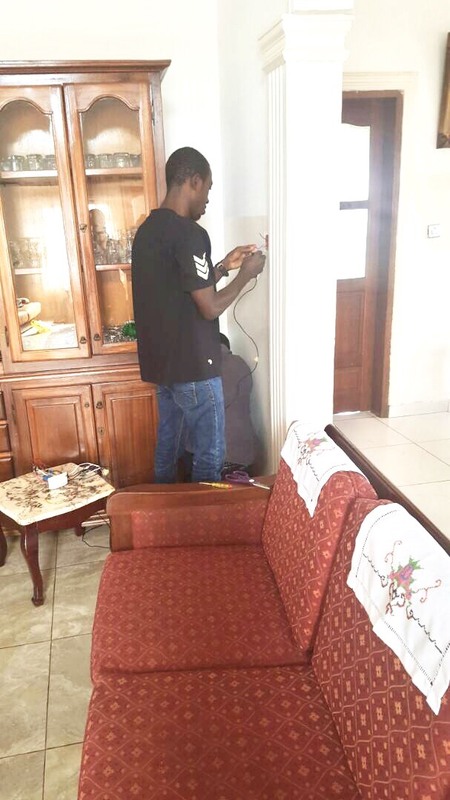 With my little understanding of electronics, I still managed to catch the brilliance of CleverHome and I loved particularly the fact that it is an all-in-one solution to energy consumption in our homes. However, I'd love to know how much we lose in uncontrolled power consumption in our homes. For I think that that would be a motivation to buy CleverHome. This is nice project with efficient features. Today we really required this kind of product to save energy and this will also protect home. We meed to save energy for future generation and your project will do that. Good initiative. Wish you the best as the project is revolutionary and can only get better. I'm eager to see and use you finished products and for your work to be recognized internationally. Very good solution to solve the problem of consumption of energy of the public administration of cameroon. First of all I would like to thank you for your precious time to comment on my project.Clever home , is a very good idea and its seems like you have enough knowledge in electronic platform , from your idea. This idea can be a reality . All the best from my side dear. I voted for you as well. Hi, this is a good idea. The remote home control is interesting and i like the ambition of sustainability- it cuts across many blocks or institutions. May be blockchain additive to the project can work especially to add more data safety and security to the pipe. I am so glad I voted this project. Clever Home indeed. Thanks for your comments, your support, encouragement and appreciation. I truly wish it helps me here. Hope my project gets to see the implementation phase. Thank You so much for your appreciation and support.Your idea/project is amazing too.I hope that it gets implemented soon and that too on a global platform.All the best and Good Luck to you. Being able to control our energy consumption via an app on our phones is indeed a clever idea which we need in our country and continent as a whole. CleverHome makes this possible for us. By being able to implement these clever ideas, we do not only care for our planet , but we also reduce our electronic bills which the average Cameroonian struggles to afford. Im eager to see CleverHome win this competition, as this will be a great opportunity for it to bring to reality better and greater ideas. Great job here, thw challenge you\'re trying to solve is a big one, it affects us too in Africa. This project will be a game changer when it comes to Energy Management. There's absolutely no doubt it'll go a long way to improve energy consumption efficiency, saving money from our purses and helping the environment at the same time. We need more of such brilliant ideas for the World to move forward. Very ingenious and useful solution. Helping families control their electricity consumption will help reduce waste and protect environment. I hope that you will win this competition, I wish you all the best for your success and remember that we will always support you. About the item, I really like it, but I just wonder if it can be use without plug in it. Overall, its a great product and I love it. Je ne cacherais pas ma joie et mon appréciation particulier pour le projet que tu as mis en place. Pour les personnes comme moi championnes à laisser les pièces derrière elles éclairées, je crois qie ce projet vient à point nommé. 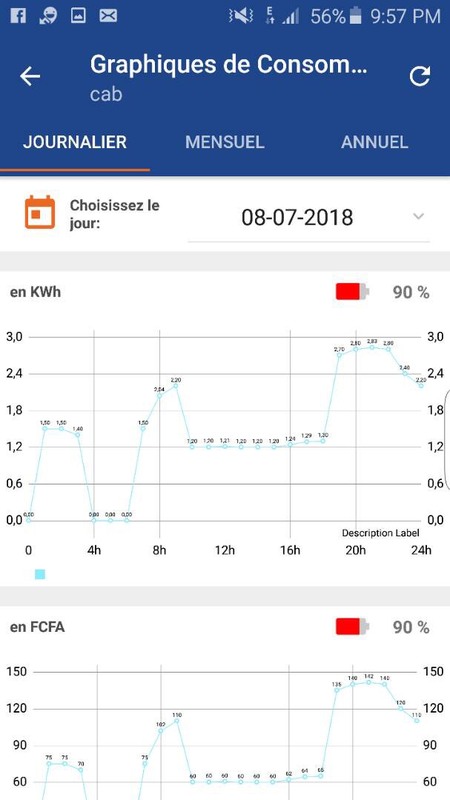 C'est sans aucunes hésitations que mon vote se dirige vers ton projet, tant il est pratique dans son aspect de gestion journalière de consommation d'électricité. Je crois qu'il y'a d'avantage d'horizon à découvrir et je te souhaite beaucoup de courage pour la suite. Excellent project. Through your project, can manage and control the use of electricity consumption so as to minimize waste of electricity consumption. This can help to reduce the bill of electricity payment and save electrical energy. Good luck. I really like your project that's such a great idea, but dose house need a main computer to run out this system? anyway good look and DO NOT GIVE UP NEVER.. if you would like to take a look on my project you can advice me abut a smart system to run out it?